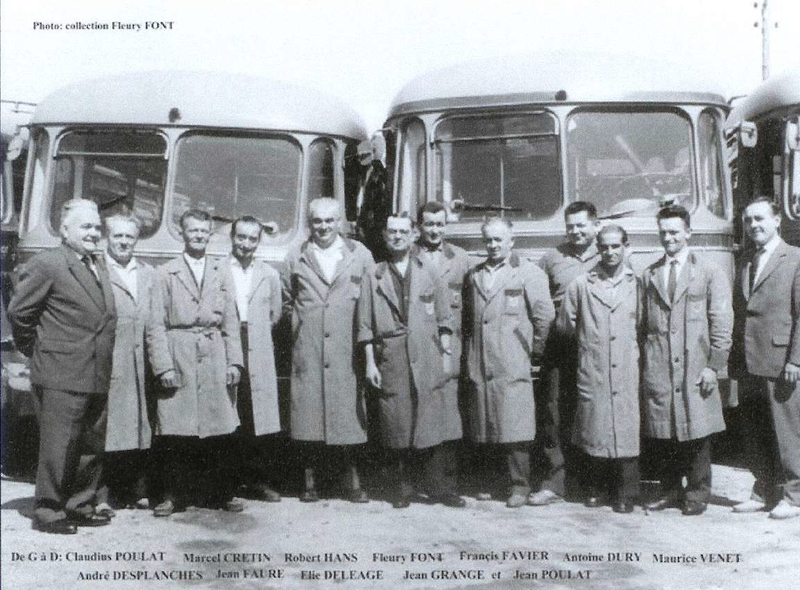 We left Marius Jasserand in 1952, selling his business to Poulat-Driot (qv). To save the reader looking it up, here again is the description of what was sold. It takes account of what Marius was actually running in 1952, and of what Poulat-Driot would be entitled to run under the new Rhône département transport plan which was coming into force in 1953. A route from TALUYERS to LYON via Sept Chemins and Orliénas. Rights in 1952 – 4 returns daily (extension to Mornant possible on Fridays). No local traffic on the section St. Genis Laval to Lyon (protocol of 28/04/39). Rights applicable from 01/01/53 – three daily returns on weekdays, 4 on Sundays and Bank Holidays. 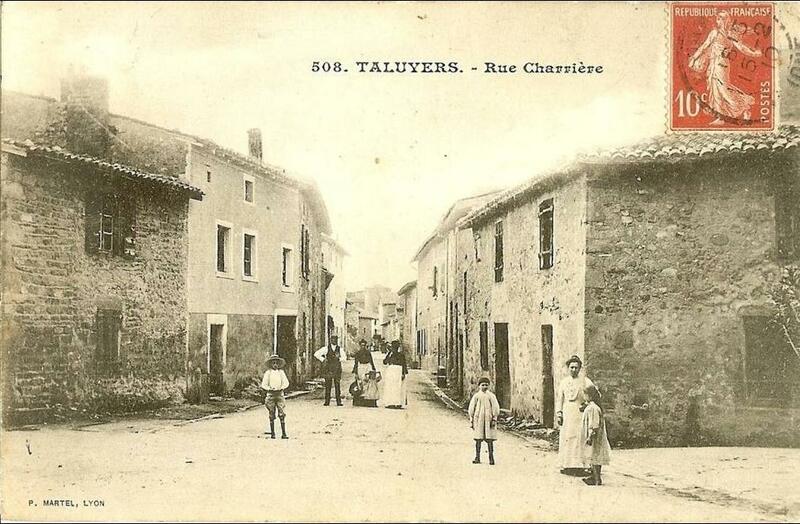 The population of Taluyers in 1954 was 671. The photo of the church is included to please the writer – it is where he was married in 1973. Rights applicable from 01/01/53 – weekdays : 3 trips Mornant – Lyon, 2 trips Soucieu – Lyon, 1 trip Brindas – Lyon, 5 trips Lyon – Mornant, 1 trip Lyon – Soucieu. On Sundays 3 returns Mornant – Lyon, 2 returns Soucieu – Lyon. Rights applicable from 01/01/53 – Weekdays – 6 journeys Mornant – Lyon (4 via Sept Chemins, 2 via Soucieu), 4 journeys Lyon – Mornant (2 via Sept Chemins, 2 via Soucieu), 1 journey Lyon – Soucieu. Sundays – 4 Journeys Mornant – Lyon, (3 via Sept Chemins, 1 via Soucieu); 5 journeys Lyon – Mornant (3 via Soucieu, 2 via Sept Chemins). Extension of LYON – MORNANT to ST. SORLIN – 1 return on Thursdays plus one return on Sundays during the summer (authorisation 03/04/52). Who were the new owners? Claudius Poulat had been a baker in Givors, but health problems led him to abandon that trade. He had no knowledge of the transport industry but needed to make a living. He was probably influenced by the fact that his wife’s cousin, Eugène Driot, already operated a route in the Loire from St. Sigolène to St. Etienne. They formed an association and the Société Poulat Driot took over on 01/01/1953. 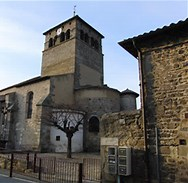 Eugène Driot born 07/11/1922 in St. Sigolène, Haute Loire, address St Sigolène, Haute Loire. The company continued to operate from the existing premises in Mornant and Lyon. Claude Poulat must have learned quickly, because the business never employed any administrative staff. All paperwork was done by the family. One vehicle, recorded by the gendarmerie on 5 June when it was stopped and controlled, was 586Y69, a Berliet. But in general, the company later modernized the fleet by buying Saviems, 12 in all. The company was authorized to run an additional timing on the Mornant Brindas Lyon route on summer Sundays – this ran Messimy 21.00 - Brindas 21.05 - Lyon 21.35, returning from Lyon at 22.00 to reach Mornant at 22.55. There was a sad accident with the death of a driver, René Boyer, when his bus collided with a lorry carrying gas bottles that rolled on to the cab. In the same year, a 750m² depot was built, with two repair pits: this subsequently became a Casino superette. Brindas wanted an extra timing. The company replied that, being unable to modify the existing timings to the satisfaction of the Mairie, it would be necessary to create an additional journey. This would entail employing an extra driver at a cost of 6,000 Francs per day. Was the commune willing to pay the bill? The prefecture asked the company to re-calculate the additional costs. The file ends there! In response to requests for improvements on Lyon-Mornant, it was authorised that the duplicate bus on the 18.45 weekday departure would be cancelled, and the vehicle used instead on an 18.15 Mon to Fri departure which would run Lyon-Brignais-Orliénas-St. Laurent d’Agny-Mornant, but to avoid competition with other existing services, would run non-stop between Lyon and Orliénas. This would begin in April on a trial basis, with the results to be reviewed on 15 June. In fact the bus ran almost empty, so the alternative solution became an 18.30 departure arriving at Mornant about 19.10 and replacing the 18.45. To satisfy all operators and passengers, it was finally agreed, that the 18.15 and 18.45 departures would be replaced by two departures at 18.35, one reserved for passengers travelling beyond Brignais. It was noted in 1961 that the Lyon-Brignais corridor had 15 departures on weekdays between 17.00 and 19.25 – 8 by Transports Citroën, 3 by Poulat and 4 by Balaye (Les Cars Lyonnais). Also in 1960 the Messimy to Vaugneray market service was discontinued from 15 March for lack of patronage. In 1969 it was the turn of the Rontalon market service to disappear, for lack of clientele. An intended check by the authorities on 5 December 1969 was abandoned – the minibus could not operate because of snow and ice! But the gendarmerie confirmed there were never more than 5 passengers – inhabitants took their cars! Les Cars Lyonnais and Poulat-Driot merged. Or rather Poulat Driot was taken over! The assets of Poulat-Driot were valued at 874,395.15 FRF, the liabilities at 104,395.15 FRF, figures undoubtedly “massaged” to produce a net value of 770.000 FRF. Les Cars Lyonnais increased its capital by 720,000 FRF and issued 4,000 new shares of 180 FRF each. Each Poulat-Driot shareholder received 5 Cars Lyonnais shares for every 2 Poulat-Driot he held. After the sale, Claudius, still in poor health, retired. His son, Jean, followed an entirely different career, setting up a business close to Lyon producing road signs. Acknowledgment is made of information provided by Jean Poulat and recorded by Antoine Dumas.